On Wednesday the Chinese Foreign Ministry said that the country’s sole aircraft carrier, the Liaoning, led a group of warships in weapons and equipment testing in the South China Sea this week. Beginning in December 2016, Beijing’s military exercises in the region have set some neighboring nations on edge, especially Taiwan and Japan, but China claims that their activities fall within the bounds of international law. Tokyo sent a Maritime Defense ship and a P3C patrol aircraft to keep an eye on the Chinese fleet as it made its way past the Okinawa and Miyako islands. The flotilla transited around the eastern and southern portions of Taiwan, en route to the southern Chinese province of Hainan. Taiwan Defence Minister Feng Shih-kuan at the time remarked that "The threat of our enemies is growing day by day,” and that Taipei “should always be maintaining our combat alertness." Despite improved economic relations between Taiwan and China, there have been simmering issues since Taipei elected Tsai Ing-wen, a liberal Democratic Progressive Party candidate, as president. Tensions were stoked last month when Tsai spoke on the phone with US President-elect Donald Trump, breaking nearly 40 years of diplomatic custom. Beijing is also displeased that Tsai is making a transit through San Francisco and Houston in January, en route to Latin America, believing she will use the visit as an opportunity to push for international recognition of her country’s independence. Chinese foreign ministry spokesman Geng Shuang told a press briefing, "The Liaoning aircraft carrier group in the South China Sea is carrying out scientific research and training, in accordance with plans…The purpose is to test the performance of weapons and equipment." This week the People’s Liberation Army Navy blogged about the Soviet-built carrier conducting drills in the contested waterway, with helicopter and fighter-jet flight tests in "complex sea conditions." 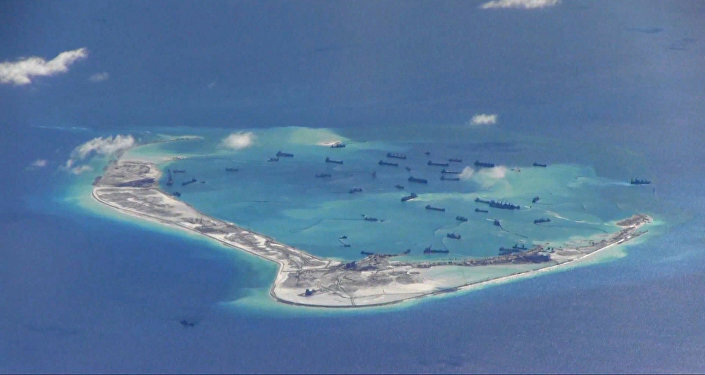 Over the last year Washington has been conducting "freedom of navigation" patrols through the region in response to China’s construction of ports and air strips on some of the disputed areas. In July 2016, Admiral Sun Jianguo of China’s Central Military Commission challenged the legitimacy of the patrols saying, "This kind of military freedom of navigation is damaging to freedom of navigation in the South China Sea, and it could even play out in a disastrous way."